The Hariyo Ban Program is named after the famous Nepali saying 'Hariyo Ban Nepal ko Dhan' (Healthy green forests are the wealth of Nepal). The first phase of the Hariyo Ban Program ended on 31 December 2016 and the second phase will run for another five years. The second phase will build on the foundation of Phase I, applying lessons learned and scaling up promising approaches. The program aims to reduce the adverse impacts of climate change and threats to biodiversity in Nepal. This will be accomplished by working with the government, communities, civil society and private sector. In particular, the Hariyo Ban Program works to empower Nepal's local communities in safeguarding the country's living heritage and adapting to climate change through sound conservation and livelihood approaches. 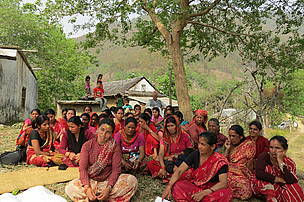 Thus the Program emphasizes the links between people and forests and is designed to benefit nature and people in Nepal. 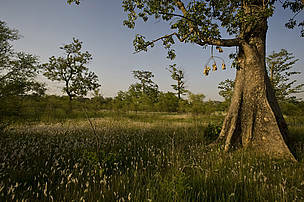 At the heart of Hariyo Ban lie two interwoven components – biodiversity conservation and climate change adaptation including market based livelihoods. These are supported by governance, and gender and social inclusion as cross-cutting themes. The Hariyo Ban Program aims to reduce adverse impacts of climate change and threats to biodiversity in Nepal. The program brings together the expertise and experience of international and national NGOs in the fields of biodiversity conservation, climate change, community livelihoods, governance, and gender and social inclusion. A consortium of four non-governmental organizations is implementing the Hariyo Ban Program with WWF serving as the managing partner. The Hariyo Ban Program is made possible with the generous support from the United States Agency for International Development (USAID). The Hariyo Ban program supports the broader conservation and development objectives and strategies of the Government of Nepal, and works closely with Government in program implementation. It also works closely with local communities, who are major beneficiaries of the program. It is partnering with several national and international resource partners from civil society, the private sector academia, and the media.